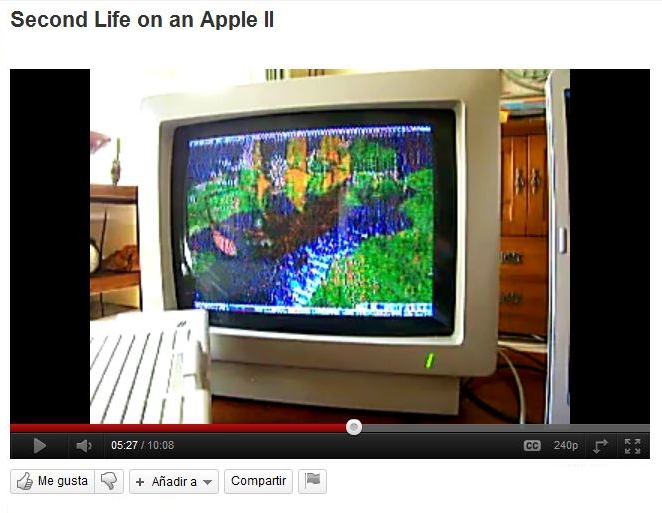 Dedicated to Steve Jobs: An Apple IIc Running Second Life! 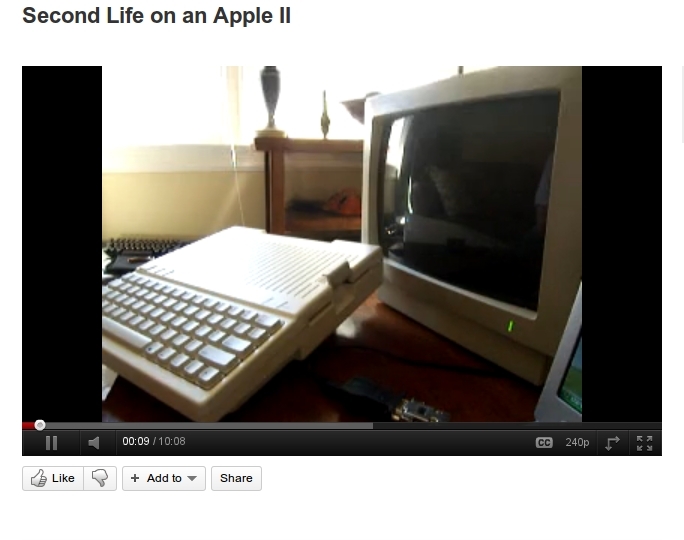 “The Apple IIc, the fourth model in the Apple II series of personal computers, was Apple Computer’s first endeavor to produce a portable computer. The end result was a 7.5 lb (3.4 kg) notebook-sized version of the Apple II that could be transported from place to place. The c in the name stood for compact, referring to the fact it was essentially a complete Apple II computer setup (minus display and power supply) squeezed into a small notebook-sized housing. Sometimes it was so horrible just waiting that the os (operating system) loads and then you have to take out the os disk and put another disk with a program or with game and sometimes the disk could be damaged when it was loading on the computer!. 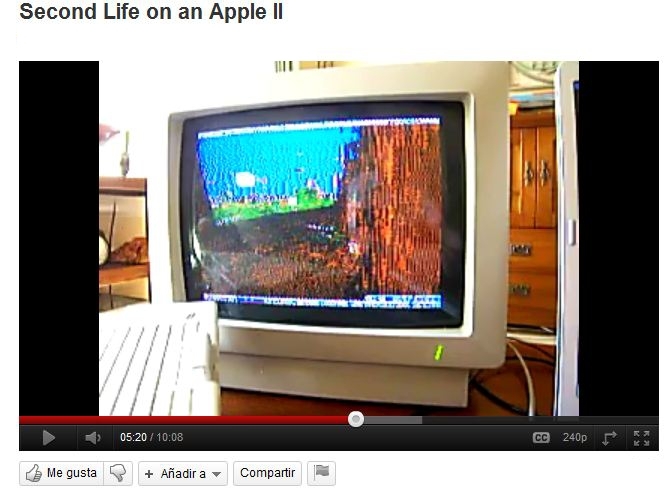 About the Apple IIc connecting to Second Life, it is quite interesting how this person could make an old Apple IIc to run Second Life. 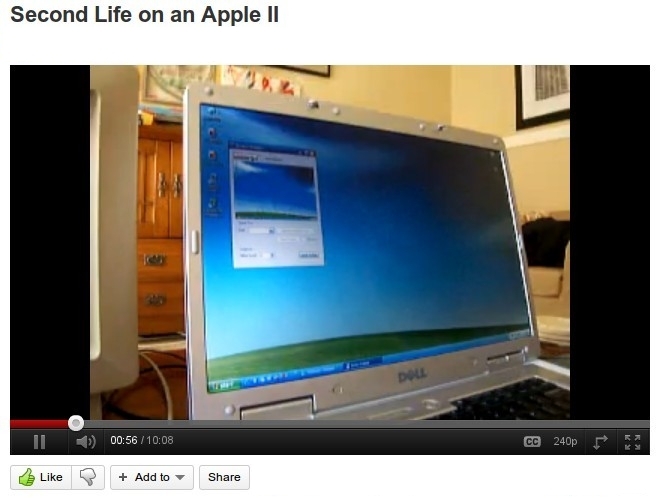 He is using an laptop with Windows XP then he just run Second Life on that computer and he capture the screen using a special program and sent the signal of Laptop screen to the Apple IIc using a cable serial port. 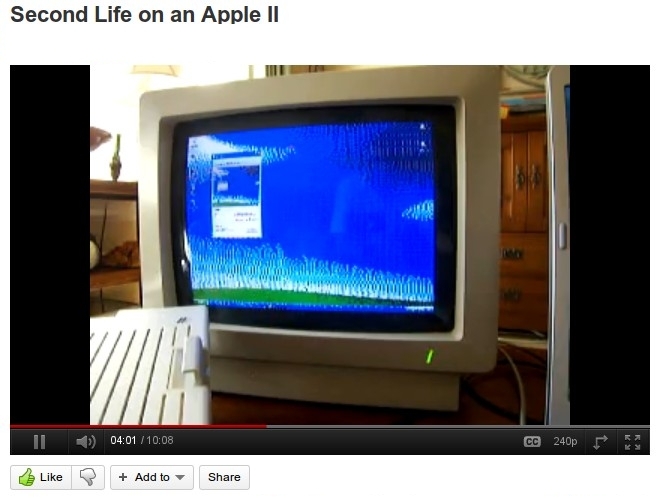 As a example, this program is working like a live camera, just capturing the images and showing it to the Apple IIc. “In the early 1980s, Jobs was among the first to see the commercial potential of Xerox PARC’s mouse-driven graphical user interface, which led to the creation of the Apple Lisa (engineered by Ken Rothmuller and John Couch) and, one year later, of Apple employee Jef Raskin’s Macintosh”. 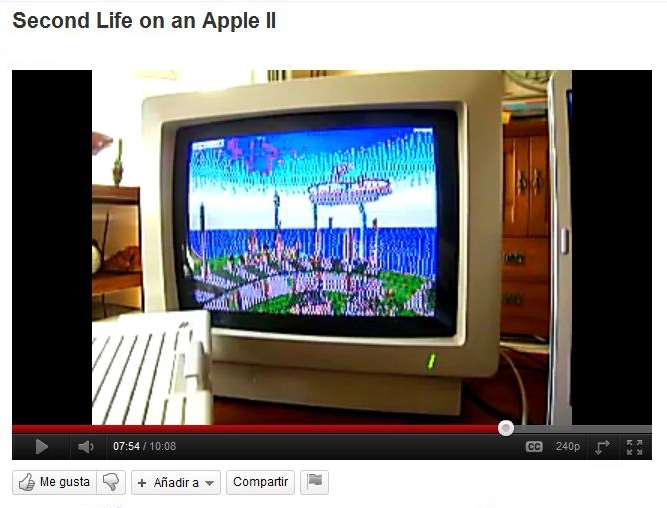 P.D: For those who are interested to see the Apple Computer running second life, then go to youtube and find on the search, I would like to include it and I sent a message to the person who upload the video but as I didn’t receive an answer from him then I decided to add some screenshots. This entry was posted in Old Post on November 13, 2011 by Xpontaneus.